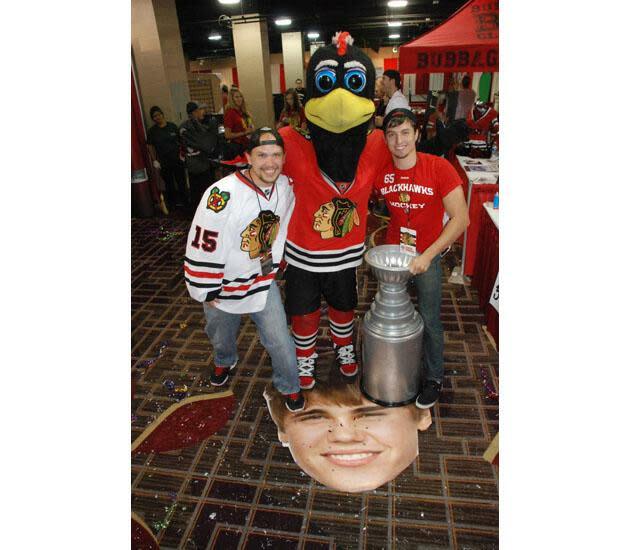 Earlier this month, Canadian pop sensation Justin Bieber angered many hockey fans for (a) yet again touching the Stanley Cup without ever having won it and, even worse, (b) standing on the Chicago Blackhawks logo in their dressing room while taking a photo of the Cup in the bowels of the United Center. The latter offense was seen as a major show of disrespect. NHL teams are careful not to allow anyone to step on the team logo on the dressing room floor … despite it, you know, being on the floor. The Blackhawks rope theirs off from the media during playoff interviews. The Boston Bruins actually position a team employee to chase away people who step too close to their logo. The fans were also outraged. 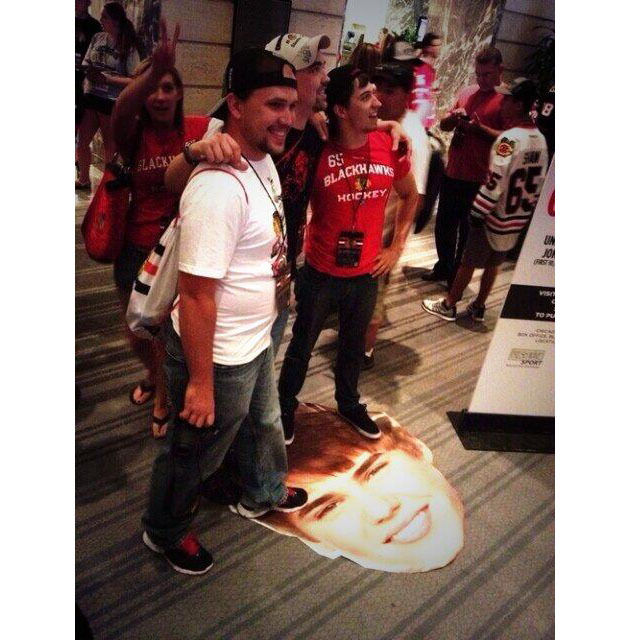 And on July 27, at the Blackhawks’ annual fan convention, a few finally took action against the Biebs – by stepping all over his legacy. That sound you heard was legions of pre-teen girls gasping and growling simultaneously. Chris Wilkerson (black shirt), Mark Wegener (white shirt), and Josh Kaye (red shirt) – residents of Des Plaines, IL – came to the Hilton Chicago with a cut-out of Justin Bieber’s face. The fans chronicled their adventures on the Stand On Bieber Twitter feed (@StandOnBieber) and have promised more photos of – you guessed it – them standing on Justin Bieber’s head. The plotted their revenge … but were denied at first. 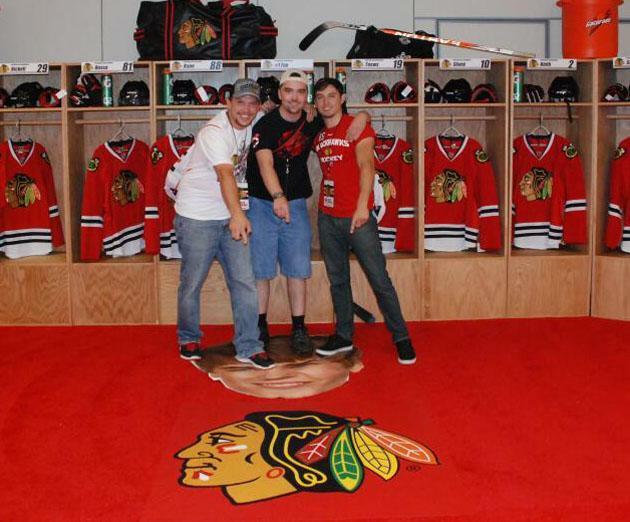 So they did, and others got in on the act … including Tommy Hawk, the Blackhawks’ mascot! At the end of the day, they had snapped over 100 photos of the Bieber head being used as a foot rest and in various other stages of humiliation – like under a Zamboni. While he apologized to former President Bill Clinton for spraying his photograph with cleaning solution after Bieber urinated in a mop bucket at a club (don’t ask), Bieber didn’t publicly apologize for the logo-stepping snafu. 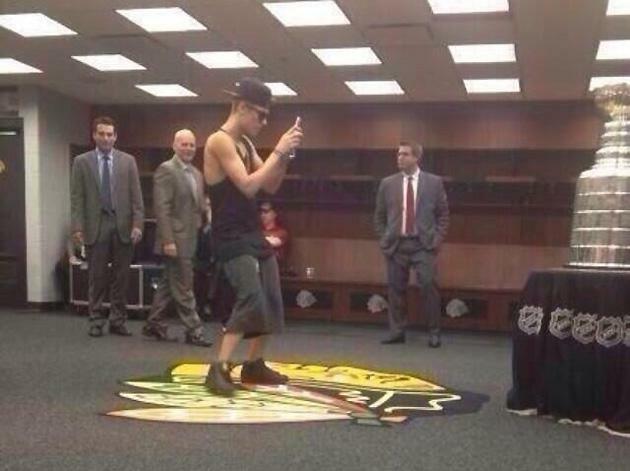 The Blackhawks PR staff, however, told TMZ that Bieber apologized to them in the dressing room after breaking hockey etiquette. Clearly Blackhawks fans weren't going to stand for that. Wait, sorry, actually that's exactly what they did -- on his face.